Your browser does not support the video tag. Ingredients 1 cup (250 ml) Lactantia® Maple Flavoured Butter, softened 1/4 cup (60 ml) granulated sugar 1/4 cup (60 ml) lightly packed brown sugar 2 large eggs 2 tbsp (30 ml) Lactantia® 10% Half & Half Cream 2 tsp (10 ml) pure vanilla extract 4 cups (1 L) all-purpose flour 2 tsp (10 ml) baking powder 1/2 cup (125 ml) blueberry jam Instructions Preheat oven to 375°F (190°C). In a large bowl, beat together Lactantia® Maple Flavoured Butter and sugars until well combined and fluffy. Scrape down bowl and beat in eggs 1 at a time, incorporating well after each addition. Beat in Lactantia® cream and vanilla. In separate bowl, combine flour and baking powder; add to butter mixture and beat just to incorporate (over mixing will result in tough cookies). Shape dough into 3/4-inch (2 cm) balls. Place 2 inches (5 cm) apart, on ungreased cookie or baking sheet. With thumb, make an indentation in the center of each. Bake for 8 to 10 minutes or until golden brown. Let cool on pan on wire rack. While cookies are still warm, fill each indentation with jam and cool completely. 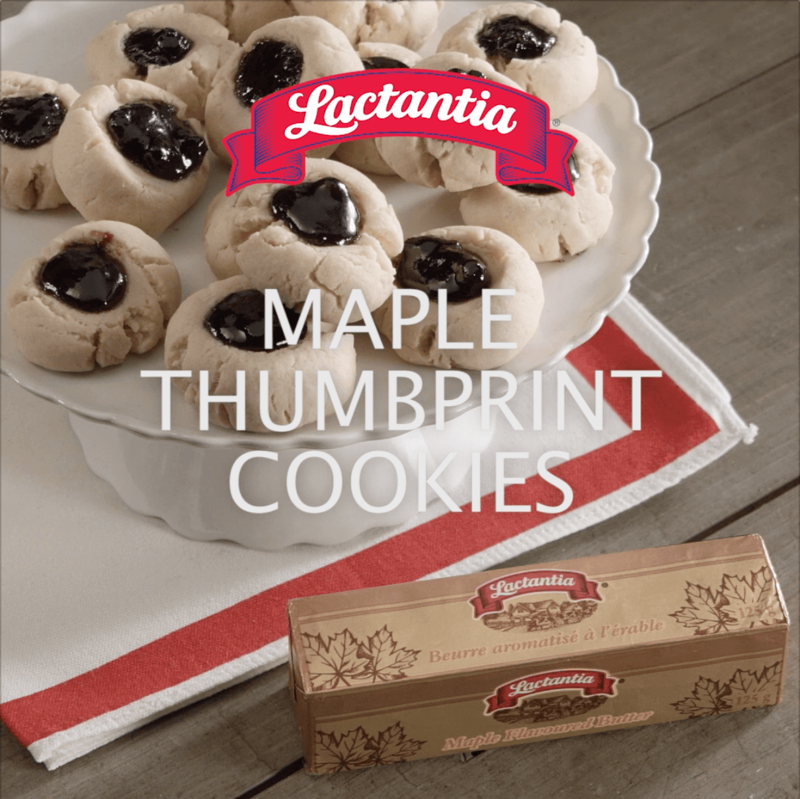 In a large bowl, beat together Lactantia® Maple Flavoured Butter and sugars until well combined and fluffy. Scrape down bowl and beat in eggs 1 at a time, incorporating well after each addition. Beat in Lactantia® cream and vanilla. In separate bowl, combine flour and baking powder; add to butter mixture and beat just to incorporate (over mixing will result in tough cookies). Shape dough into 3/4-inch (2 cm) balls. Place 2 inches (5 cm) apart, on ungreased cookie or baking sheet. With thumb, make an indentation in the center of each. Bake for 8 to 10 minutes or until golden brown. Let cool on pan on wire rack. While cookies are still warm, fill each indentation with jam and cool completely.